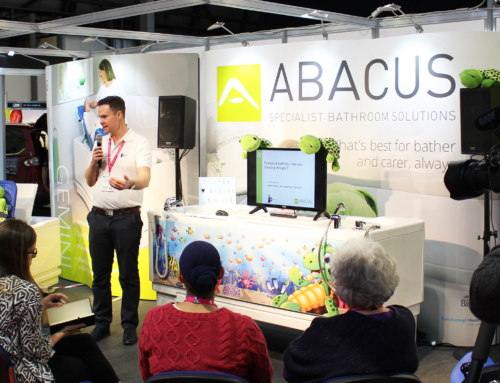 We demonstrated our newly launched Aquanova assistive baths to large numbers of Occupational Therapists and families with disabled children at Kidz South (Rivermead Leisure Complex, Reading, 12th June). We have provided stylish and ergonomic accessible bathing solutions for over 25 years. Our team works successfully with healthcare professionals and families to ensure the wellbeing, dignity and care of young people with disabilities are maximised when bathing. 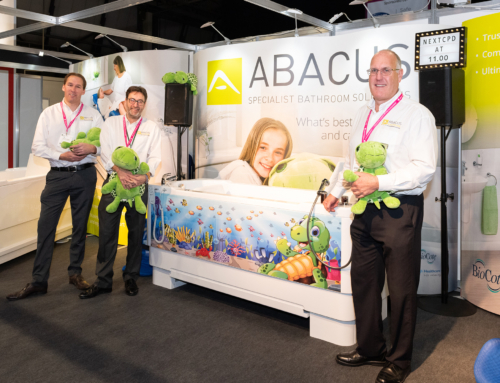 We debuted two power-adjustable baths from our recently launched next generation Aquanova range at Kidz South, namely the Gemini and Scorpio 1700. All baths in the latest Aquanova range now provide smoother and quieter operation so that the bathing experience is enhanced for user and carer. The latest Gemini assistive bath includes an integrated, height adjustable platform suitable for bathing, drying and changing users in a safe, relaxed and comfortable manner. It also ensures carers or parents can care for their client or child without the need to bend or lift – significantly reducing the risk of back injury. When young users are ready to bathe, they sit on the platform and the Gemini is then raised, gently immersing them into temperature controlled water. The bath and the bather can then be raised to a comfortable height for the carer, again to protect against potential muscle strain. The Gemini has a compact footprint ideal for domestic bathrooms where space can be limited and is suitable for use with ceiling track hoists, also available from us. Alongside the Gemini, our team demonstrated the new Aquanova Scorpio 1700 and a wide range of postural supports. The next generation Scorpio is a versatile bathing system that is supplied with either a manual or powered transfer seat. This seat allows safe access into the bath for disabled individuals without the need for a carer to manually lift them or adjust their position. Once the Scorpio is filled with water, the seat can be raised to the transfer height required by the bather and secured in position, before lowering gently into the bath. As well as the powered seat, the bather can also transfer into the bath from a wheelchair, mobile hoist or ceiling track hoist. Compatible with the Gemini and Scorpio, Abacus’s postural supports are highly regarded by therapists as they allow personalised positioning for bathers. Designed for individuals requiring specialist care, the range includes Knee Breaks, Back Rest Cushions and Net Postural Supports.